Today is the 2nd annual International Save Your Photos Day. But, really… isn’t every day Save Your Photos Day? I am reminded of the old television PSA: Do you know where your children are? Do you know where your precious memories, captured in photographs, are? Every day is Save Your Photos Day! Are they on your cell phone? And do you know how to get them out of your cell phone? And are they backed up, in case you lose your cell phone? Are they (digital) spread across multiple directories, hard drives and devices? Are they (paper) languishing in dusty boxes in the garage, or under the bed? I have just applied for certification by APPO as a Personal Photo Organizer. 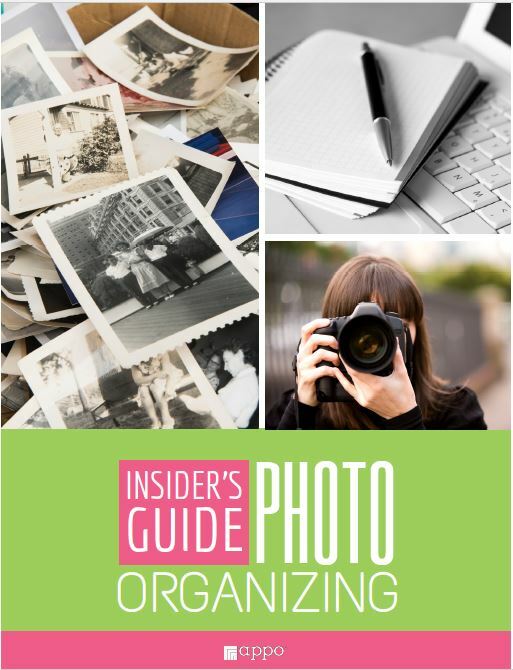 And, to get you started (you know I’m all about helping you DIY), here is a link to download a nifty APPO e-book (16 page PDF): Insider’s Guide to Photo Organizing. This FREE guide will help you find and gather; sort and organize; archive and backup; maintain, celebrate, and share your favorite photos! Of course, you can also ask me for help, or for a referral to an APPO organizer near you. Leave your favorite photo organizing tip, or challenge, in the comments below! OCTOBER 8, 2015 UPDATE: APPO certification complete! Yay! Perfect for today…off to my sister’s to help do just that. Wish us luck with (lots of) family photos. Thanks for the post. So many people need help with this! In retrospect, having a shoe box full of printed photos was actually a piece of cake compared to the devices overflowing with images we have now, right? Well…as an APPO-certified photo organizer myself, I DO know where my photos are, LOL! Of course, we are in the minority…that’s how APPO has come into existence after all. The Insider’s Guide is a great resource to share with your audience! Happy SYPD! Thanks for the link to the APPO guide! I haven’t seen it before. Nice little guide, eh? You’re welcome! Congrats on applying for APPO certification! My photos are pretty organized, but I have to admit I don’t go overboard with taking photos so I don’t have a lot to manage. Thanks, Sarah! I have some digital photo purging to do because I don’t always get rid of the duplicates and bad photos right away. I love the quote “Every day is Save Your Photos Day!” It’s so important to take care of your photos – digital as well as physical. Thanks for sharing. Good luck on your application for certification to APPO. Thanks, Sabrina! I just cringe when I hear about someone losing their phone, and all the photos on their phone, simply because they never knew how to upload them or back them up. Wow, Hazel, you’re really getting into some very interesting things these days! Congratulations! I downloaded the ebook when you posted this, but forgot about it already. I just bought a new camera so I’m really glad I came back to read this again! I’m glad you came back too. Enjoy your new camera! Hi Deb! There are so many things we can do to share and enjoy our photos. And it’s so easy to just leave them in our phones and computers, where we forget about most of them. Glad you are enjoying some of the old paper ones. Don’t forget to scan the ones you’d hate to lose in a fire and/or if they’re deteriorating they can be fixed! I loved that you shared the APPO ebook. I should do that too! I’m so glad you joined APPO and have gone through the certification. It’s my favorite part of my business now! I still feel like I have a lot to learn! I don’t say this often enough, but thank you for all that you do to make other people’s lives better!! Have tossed bin liners (seriously) of photos since my mum’s death; but I’m still struggling with the whys and wherefores of what I have left. Therefore, I have downloaded the nifty guide – thanks again! Aw, thanks, Janie! I hope the guide helps you. If you have questions, you know where I live!